A friend of mine recently got a job at PopCap. About a week ago she wrote to tell me that they had released a new game called Peggle. I’ve played a few PopCap titles in the past, but only the demos–I’m a notorious skinflint when it comes to shelling out cash for computer games. Still, I wanted to support my friend in her new endeavor, so I bought this one. DO NOT DO THIS!! This game is to free time what whales are to krill. Even now, as I type this, I am trying to resist the urge to go play a few rounds (and my resolve has already faltered a few times since I wrote the first paragraph). 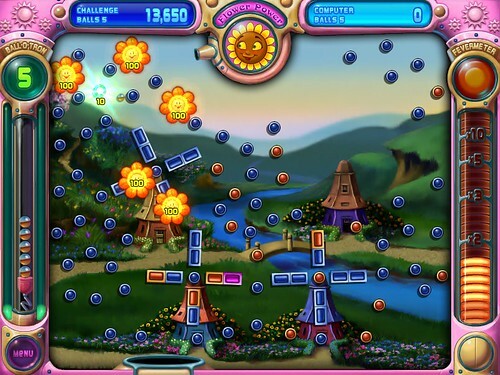 If this game were half as addictive, I would urge you to buy a copy; as it stands, I’m afraid I cannot, in good conscience, recommend Peggle to anyone who has a spouse, a child, a friend, a job, or reservations about wearing astronaut diapers to avoid ever having to leave the PC. Under these circumstances, I, too, would be be wary of the professor’s convoluted reassurances as to the safety of the box. That’s called skepticism, not faith. CLINTON DEMANDS OBAMA DENOUNCE DONOR’S REMARKS, HOWARD DEAN DEMANDS GOP CANDIDATES DENOUNCE ANN COULTER, etc. Several prominent bloggers, on both the left and the right, have made careers of reprinting the stupidest thing ever written by someone on the other side (usually the 113th comment, by someone named “TrueAmericanPatriot71,” in a thread on freerepublic.com or democraticunderground.com) and saying “OMG this is what everyone who disagrees with us believes!! !” This practice appears to have percolated upward. 7/16: The next round of the Cliche Rotation Project is going on now. Submit your entry here. Rosecrans and I had a weird moment of Baldwinicity last month, as we were both struck by essentially the same idea at the time. I called on my readers to participate in The Cliche Rotation Project, a drive to replace old and worn out sayings with new ones of roughly equivalent meaning. A few days later, Rosecrans unveiled the Contest for Total Idioms, in which readers of The Morning News were asked to submit newly minted proverbs and adages. Well, the winners of the Contest for Total Idioms were announced today. So it seems only fitting that I published some submissions in the CRP as well. I got lots and lots of entries, but have narrowed this batch down to 30. I think this might become a reoccurring feature, though, so you’ll see some of the rest later. And you shouldn’t hesitate to send new ones to matthew@defectiveyeti.com. So: out with the old and in with the new! Or, as I like to say, let’s shed skin and slither in style. Some time ago, my brother-in-law decided to teach my daughter, N., the phrase, "That dog don't hunt," to be used after any sentence that had a lie or tall tale included in it. N. used it quite often at first and even would ask me to make up some untrue statement just so she could respond with, "That dog don't hunt!". Having a three year old armed with this phrase and knowing when to use it was a great ice breaker and/or party trick. The phrase eventually wore out of it newness and was not used. Recently, N. and I were visiting a friend, and when someone made a random, nonsensical comment, N. responded with, "That spoon don't scoop!" My jaw dropped and I had to ask her, "Where did you learn that?" and she responded, "I made it up!" Either she is pretty darn smart or a pretty darn good liar...That dog don't hunt, N.! Yeah, along with the kid activities Heather previous classified here as “cute the first time, obnoxious the 65,000,000,000th,” add “using a catchphrase.” I taught The Squirrelly to use the phrase “down the hatch!” when eating. Hilarity ensued–until he started bellowing it before every forkful of Veggie Dog during every single meal. That’s a cliche in dire need of rotation. I will be on the teevee this evening, telling a story for the pilot of A Guide to Visitors. You can see it on The Seattle Channel, this evening at 9:00. Or, if you are one of the seven people on teh NetarWeb that has “RealPlayer” installed, you can watch it online here (my story is third). I am currently getting a ton of traffic from this URL: http://buzzfeed.com/buzz/Asslessness. I was just joking about having written “a novella which retells Star Wars Episode IV: A New Hope from the point of view of the Garbage creature,” but the number of people sent email expressing interest in reading it was, frankly, terrifying. Oh man, this I love. A Google search indicates that no one has ever formed a heavy metal Christian band called “BC/AD.” That’s just unacceptable, people.